How is an Anime Figure Made? A great video (from about 2 years ago) linked from http://omgwebsite.com/2010/03/how-a-figure-is-made/ answers that question that might be going through your mind. Let's face it, Japanese anime figures usually have a meticulous art and sculpture to them that is most definitely is NOT akin to those cheap, corny American action figures you find littered throughout Walmart. 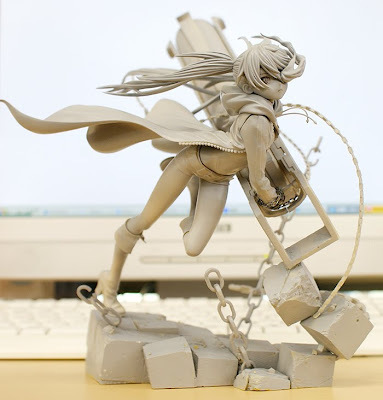 The production of say a Black Rock Shooter or a To Heart figure by Good Smile Company, Alter, Kotobukiya, Taki, etc are done in a number of steps. I won't take away from the video and sometimes the production is different but it's in these generalized steps. Many times only one production is done and thus if you don't order your figures in time...you are out of luck. Sometimes, a company will do a reproduction (like Max Factory did with the K-On! figmas) which means that they simply told that factory to do another batch of figures. This happens only if the figures sell very, very well. This whole going from the 'base-model" to a factory in China is sometimes why the final production model might look slightly different. The factory is watched over by quality reps of the company and usually all goes well. Bootlegs occur when a factory in China gets a mold and trys to cheaply produce a bunch of say, Nendoroid figures. sometimes the very factory that made the real deal figures have been rumored to do this but without the qualty control and thus you then get shady sellers in Hong Kong pushing those cheap fakes; fakes that could very well be so bad, they are poisonous too o_O.